Alzheimer’s is the most common type of dementia, affecting an estimated 5 million people in the United States. Alzheimer’s disease is irreversible and slowly gets worse as the disease destroys the brain’s memory and thinking skills. There is no cure for this debilitating disease. Alzheimer’s begins to damage the brain before signs are seen in most people. This debilitating disease causes plaques to form in the brain that stop parts of our brain from communicating and connecting with each other. The damage eventually causes brain tissues to die. Losing or misplacing things of value or things we use on a daily basis like wedding rings or putting kitchen utensils in refrigerator. 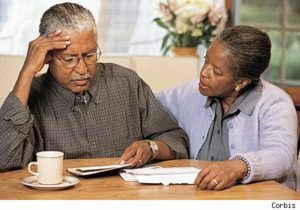 Alzheimer’s disease impacts African-Americans and Hispanics disproportionately. African-Americans are impacted worse being twice as likely to have Alzheimer’s. Other health conditions like high blood pressure and socioeconomic factors contribute to the challenges of addressing Alzheimer’s in the African-American community. African-Americans and minorities are also more likely to be diagnosed with Alzheimer’s in the later stages of the disease or to be misdiagnosed to due other illnesses, a lack of awareness, and a lack of access to appropriate medical care. There is a strong need for more data and information that is specific to the African-American community in terms of not only disease More research is needed to get a better picture of not only the state of the disease in minority communities but also to identify culturally appropriate strategies to address them. How Do I know if I have alzheimer’s disease? Doctors and researchers are still trying to find out what causes Alzheimer’s. For most people, the cause has been linked to genetics. Other causes of the disease are related to our environment and lifestyles. One of the first signs of Alzheimer’s is having trouble with remembering things. 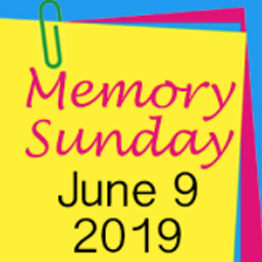 We all have a decline in our memory as we age, but when the memory loss is are more than what is normal for our age, we have what is called, Mild Cognitive Impairment (MCI), which increases our risk for developing Alzheimer’s. Symptoms can be different for each person. Other common signs and symptoms seen in the earlier stages of the disease are trouble with how we think and in our ability to do things like reading and make daily decisions. More research is needed to identify blood test and other ways to find Alzheimer’s earlier in those that show some of these signs. Is there a way to stop or prevent alzheimer’s? 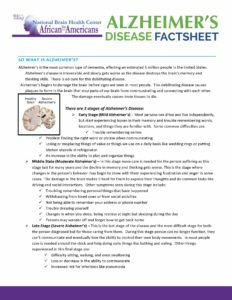 There is so much that is still begin learned about Alzheimer’s disease, its causes and how to treat it. Similar to other chronic health conditions, we can help reduce our risk for Alzheimer’s by making healthier and better lifestyle choices. Eating healthy food like more fruits, vegetables and whole grains could help to reduce our risk along with being active and doing things that help to keep our brain stimulated. Research and clinical trials are continuing to look into these relationships between Alzheimer’s and how we live to identify more ways to combat this 100% deadly disease. Is there treatment for alzheimer’s? As there is no cure for Alzheimer’s disease, the goal of treatment is to maintain and delay the decline in memory and cognitive functions. There are several medications that help to delay the symptoms of the disease can be used to treat all stages of Alzheimer’s. Medications or professional healthcare to manage the behavior changes related to Alzheimer’s are also part of the treatment and care provided to persons living with Alzheimer’s. Support for families and caregivers play a major role in the treatment and management of Alzheimer’s. Healthcare providers should be mindful to include the caregivers in the treatment plan and to work with them to develop a plan of care that will meet the needs of the persons diagnosed as well as the needs of the caregiver that may arise as the disease progresses. Referrals to support groups and other social services are good to consider.